Packaging today has to fulfill the desires of consumers for two potentially contradictory things – sustainability on the one hand and the ability to convey premium quality on the other. One way to do this is to increase the levels of recycled content within the bottle, another is to lightweight an existing or new design without compromising the appeal of the brand to the consumer. 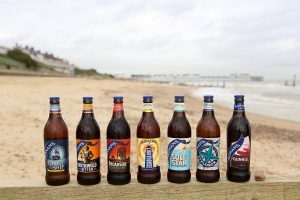 Adnams is an English regional brewer which has consistently placed the environment and responsible production at the heart of its brand positioning. It had already led the UK beer industry in the adoption of lightweight glass packaging when it came to O-I in 2015 with a desire to push the boundaries even further. Having pioneered the use of lightweight branded glass in the premium packaged ale sector when it launched a 299g bottle in 2007, O-I has now enabled Adnams to take a further step forward. Its new 280g bottle is the UK’s lightest branded 500ml glass premium ale bottle, while retaining the appealing premium brand image. One key design parameter was to cut weight while retaining the distinctive shape and height of Adnams’ bespoke bottles. This meant that there was no impact on the filling equipment, tertiary packaging or brand image. The new 19g reduction saves 15gCO2e per bottle and removes 115 tonnes of glass from the waste stream. Added to the 125gCO2e saving per bottle from the 2007 redesign, this has saved 1000 tonnes carbon per annum and removed over 1000 tonnes glass from waste streams. Since 2007, virtually all ales have developed sub 300g glass packs, scaling the savings enormously, and helping regenerate the entire bottled ale sector, which had grown to £490 million by 2015. Adnams hopes its latest move will inspire others to once more seek further carbon and resource savings.